Atmospheric circulation on hot exoplanets: What about magnets? Astronomers have a favorite joke. They tell it in classes, to visiting speakers, at conferences, and when they’re tipsy at parties. Are you ready to hear it? Here it is: “Hey, have you considered magnetic fields?” Hahahaha! Why is this funny? (Trust me, it’s funny.) Let me try to explain—this joke highlights the absurdity of our quest to understand nature. Many astrophysical objects generate strong magnetic fields; without accounting for them, our theories for how such objects behave are simply wrong. But magnetic fields are quite difficult to analyze (so much fancy math). People treat them like a capricious deity: we usually escape their wrath, but every so often they mess everything up. We laugh at the joke because the alternative is crushing, existential despair. Maybe things aren’t that bleak. A few brave scientists are willing to wrestle the beast. In this paper, Batygin et al. explore how magnetic fields shape atmospheric circulation and energy transport on “hot Jupiter” exoplanets. This dovetails with the authors’ previous work on how “Ohmic dissipation” explains the surprisingly large radii of many hot Jupiters. Using an analytic theory backed up with heavy-duty numerical simulations, the authors claim that magnetic fields significantly change the pattern of circulation in the upper atmospheres of hot Jupiters. This paper is the first to fully integrate magnetic effects into 3D simulations and serves as the stepping stone for future work. 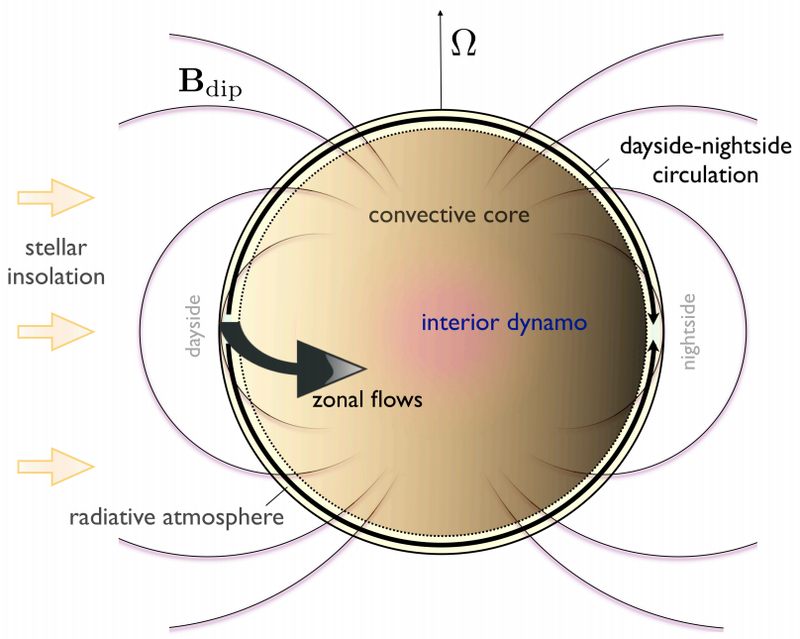 Figure 1: Schematic of atmospheric circulation on hot Jupiters (Batygin et al. 2013). The left side of the planet is the dayside; in the upper atmosphere, the dayside/nightside temperature contrast drives a complicated pattern of atmospheric flow from the dayside to the nightside. Below a pressure of ~0.1 bar, zonal (parallel to lines of latitude) flows dominate. Hot Jupiters are locked in tight orbits around their parent stars, roasting in stellar radiation. While Jupiter takes almost 12 years to go around our Sun, a “year” on a hot Jupiter could be as short as two days. All that radiation makes hot Jupiters really, err, hot! Most are ~2000K, but some are hotter than 3000K! 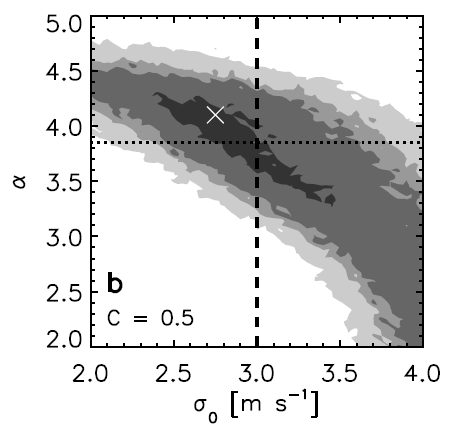 Figure 2: Effects of increasing magnetic fields on circulation in the upper atmosphere of a hot Jupiter (Batygin et al. 2013). Brighter colors indicate higher temperatures. Arrows show the direction of the flow. In the top plot, there is no magnetic field; the atmosphere flows from the hotspot on the dayside to the nightside. Magnetic fields dramatically change the character of this flow; as the magnetic field increases in the simulations for the middle and bottom plots, zonal jets start to dominate the flow, as is always typical of the lower atmosphere. Figure 1 is a cartoon of the large-scale atmospheric circulation on hot Jupiters. In the absence of magnetic fields, the upper and lower atmosphere feature two distinct types of circulation flows. In the upper atmosphere, winds blow away from the dayside in all directions towards the nightside. Beneath the upper atmosphere, zonal flows dominate. If you look at Jupiter, you see bands of colors. Those are zonal flows, moving quickly parallel to lines of latitude, in the upper atmosphere. The winds in each band go in the opposite direction of those in the bands above and below it. The internal dynamics of hot Jupiters are complicated, and aren’t discussed in detail in this paper. The upper atmospheres of hot Jupiters are electrically conductive because temperatures are high enough to ionize alkali metals like potassium and sodium. Previous studies simply assumed that magnetic fields roughly act as a sort of drag, which slows down atmospheric circulation everywhere, but doesn’t change its qualitative form. Batygin et al. find that magnetic fields do indeed cause wind speeds to decrease in the zonal flows of the lower atmosphere. In contrast to all previous work, however, magnetic fields fundamentally change the nature of circulation in the upper atmosphere. In Figure 2, the top plot shows simulation results with no magnetic field for circulation in the upper atmosphere. As described above, winds blow away from the hot spot in the dayside. As the magnetic field increases in the middle and lower plots, the flow in the upper atmosphere begins to resemble that in the lower atmosphere—zonal jets dominate. Unfortunately, direct detection of magnetic fields or atmospheric circulation on a hot Jupiter may take a while. Still, this paper is a big step towards answering astronomers’ favorite joke in a serious way.